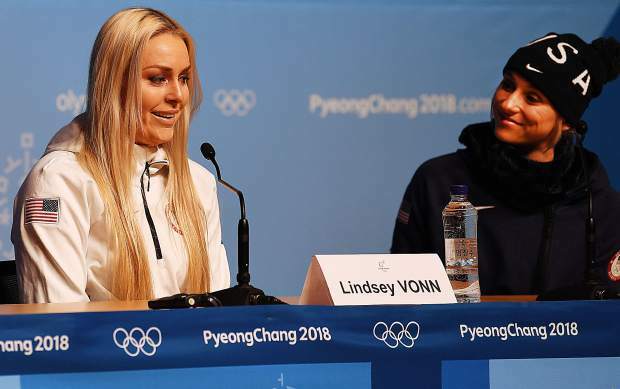 PYEONGCHANG, South Korea — Lindsey Vonn gave an emotional news conference on Friday, Feb. 9, after arriving in Pyeongchang, South Korea, for her fourth Olympics, saying a victory here would be dedicated to her grandfather, who died in November. Don Kildow died last year at the age of 88. He taught Lindsey’s father how to ski, igniting a passion that was passed down to Vonn. Kildow was stationed in Korea during the Korean War, and now Vonn will try to win gold here in his honor. Vonn arrived in South Korea on Thursday, Feb. 8 after a 24-hour journey due to a delayed flight. She wore gloves for the press conference to fend off illness, and she brought along her dog, Lucy, for support. These are her first Olympics since Vancouver, British Columbia, in 2010, where she won gold in the downhill and bronze in the super-G. She missed the Sochi (Russia) Games with a knee injury. Vonn started the season relatively slowly, with two DNFs and one 12th-place finish in Lake Louise, Alberta, where she usually dominates. But she has turned things around since then, and comes into the Olympics red-hot after back-to-back wins in the downhill at Garmisch, Germany.